Bananas have been found to be beneficial for a number of medical complaints. In addition to lifting your mood, bananas have been found to help you overcome a number of illnesses and conditions. Hangovers: One of the quickest ways to cure a hangover is to make a banana milk shake, sweetened with honey. The banana calms the stomach and, with the help of the honey, builds up depleted blood sugar levels, while the milk soothes and re-hydrates your system. Smoking: The B6, B12,potassium and magnesium found in bananas help the body recover from the effects of nicotine withdrawal. Stress: A high-potassium snack, such as bananas, can help normalize the heartbeat, send oxygen to the brain and regulate your body's water balance. Mosquito bites: Next time you are bit, try rubbing the affected area with the inside of a banana skin. Many people find it amazingly successful at reducing swelling and irritation. Anaemia: High in iron, bananas can stimulate the production of hemoglobin in the blood and so helps in cases of anaemia. Ulcers: The banana is the only raw fruit that can be eaten without distress in chronic cases. It also neutralizes over-acidity and reduces irritation by coating the lining of the stomach. Strokes: According to research in The New England Journal of Medicine, eating bananas as part of a regular diet can cut the risk of death by strokes by as much as 40 percent. 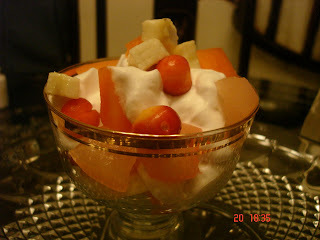 So reach out for the Banana and whip it in your favourite fruit salad and other desserts.